The TPz Fuchs is a 6-wheeled amphibious infantry transport carrier. 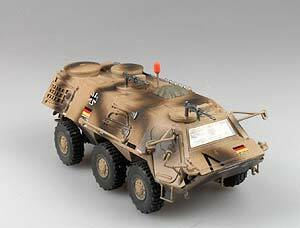 It was developed since the 60s and introduced into the German Army in 1973. Until 1993 there were more than 1000 produced in several different versions. Main versions are designated as Fuchs A1 - A8 and contain engineer vehicles (as this model), electronic warfare, command vehicles, NBC vehicles, recon vehicles and (A7 and A8 versions) uparmored versions of the previous ones. Besides the use in the German Army the Fuchs was delivered to the US Army, the Netherlands, UK, UAE, Israel and Venezuela. The Fuchs has (depending of the special version) up to 3 MGs, a MILAN AT-Launcher and 6 smoke discharger for self-defense. The newest A8 versions are going to get the new FLW200 weaponstation with a possible armament of the 40mm machine grenadelauncher. The vehicle got a 320hp engine which allows a maximum speed of 96km/h at land. In the water it can achive up to 10km/h with the two steerable propeller at the back end. The Fuchs weighs around 17tons, the armored plates of the body are bulletproof against infantry rifles up to 7.62mm and artillery shrapnels. All three axles are driven and the front two axles are steerable - so it has a good cross-country performance. The Fuchs is 6.83m long, 2.98m wide and 2.30m high. The depicted Fuchs 1 A4 is a transport and support vehicle for engineer groups. It is in service in the ISAF contingent in Afghanistan. It has room for 8 soldiers in the back and two at the front. It carries engineer material as barbed-wire, mines, directional mines, etc. The A4 can be distinguished by the two round barbed wire roll containers on the rooftop.